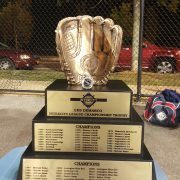 The Lexington Blue Sox took the ICL Title with a 5-4 win over the Andre Chiefs in game three on Tuesday night at Morelli Field. More from Bruce Hack is coming soon!!!!! Drew Leenhouts tossed a complete game four-hitter to lead the Lexington Blue Sox to a 5-0 shutout win over the Andre Chiefs in Game Two of the ICL Finals. Game Three is Tuesday night at Morelli Field in Melrose on Tuesday at 8:00 PM. Game story will be posted soon by Bruce Hack. For the sixth straight season, and for the seventh time in the last eight years, the Lexington Blue Sox and the Andre Chiefs will meet to decide the Intercity League Championship. Jared Freni punched the Chiefs’ ticket to the dance with a lights out eleven K, six-hitter, when the he blanked the gutsy and game Reading Bulldogs 3-0 in the deciding game of their best of five series at Maplewood Park in Malden on Thursday night. Peter Copa was the offensive standout of the night with a first inning RBI single and a third inning solo homer. Steve Gambale drove in the final Chiefs run with a two out single in the bottom of the sixth inning. Bulldogs’ starter Jack Burke allowed only four hits, and struck out four, in four innings, before giving way to veteran Steve Hueston in the fifth inning. The best of five Championship Series will get underway on Sunday at Morelli Field at 8:00 PM. All games will be played at the Melrose venue, with Games Two and Three planned for Monday and Tuesday, and if necessary, Games Four on Wednesday, and Game Five to be determined. All games in the series will begin at 8:00 PM. The Lexington Blue Sox scored eight times in the bottom of the first inning on the way to a series clinching 8-4 win over the Watertown Reds in Lexington on Wednesday night. After dropping the series opener, the Blue Sox won three straight to take the series 3-1 and advance to the ICL’s Championship Series that will begin on Sunday at Morelli Field. Dan Graham, Jeff Vigurs, Josh Hassell, and Ross Curley, all had two RBI’s in the first inning. Aidan Freeburg chalked up the win with help from Tony Annino in the sixth and Jimmy Hill in the seventh. Kyle LaVigne had three hits and drove home two of the Watertown runs. At Morelli Field, the Reading Bulldogs got six innings of four hit pitching from lefty Tim Woods, then scored five times in the bottom of the sixth, to break a 1-1 tie, and beat the Andre Chiefs 6-1. Mike DeDonato and Chris Bosco each had two hits and an RBI to lead the Bulldogs at the plate. E.J. Martinez also drove in a run for the Bulldogs. Tim Dunphy allowed only two earned runs and struck out six for the Chiefs. Peter Copa drove in the lone Chiefs run with a third inning single. Game Five of the Bulldogs-Chiefs series will be played at Maplewood Park/Malden Catholic on Thursday night at 8:00 PM. Matt Karis pitched five strong innings to record the win when the Lexington Blue Sox edged the Watertown Reds 3-2 at Victory Field on Tuesday night. With the win, Lexington takes a 2-1 lead in the series. Dan Graham and Jeff Vigurs both had RBI singles and Dave Ahern scored the game winning run on a wild pitch. Borja Jones-Berasaluce worked a scoreless sixth and Jeff Blount blanked the Reds in the seventh to get the save. Dan Chaisson, with a solo homer, and Kyle LaVigne, drove in the Reds’ runs. Jonathan Bishop went all seven innings for Watertown and struck out five. The Reading Bulldogs used some sparkling defense, and got six solid innings from Wayne Lundgren, to beat the Andre Chiefs in Game Three, 5-2. The Chiefs lead the series 2-1. Steve Busby had a 3 for 3 evening, and along with Darren Hartwell, turned in several outstanding plays in the outfield. Kyle Devin, Chris Bosco, Johnny Hayes, Mike Taylor, and Busby, all drove in a run for Reading. Juan Portes provided all the scoring for the Chiefs with a two run homer in the bottom of third inning. Sam Kasten went the distance for the Chiefs and struck out nine batters. It’s on to Game Four for both series on Wednesday night. The Chiefs and Bulldogs meet at Morelli Field in Melrose and the Reds and Blue Sox get together at Lexington High with both games starting at 8;00 PM. Tony Deshler and Juan Portes hit back to back homers in the top of the eighth inning when the Chiefs rallied back from a 2-1 seventh inning deficit to go on and beat the Bulldogs 5-2 at Morelli Field. Mitchell Clegg went the distance to get the win. Kyle Devin gave Reading their 2-1 lead with a solo homer in the fourth. Cody Hall pitched well for the Bulldogs. The Chiefs lead the series 2-0. In Lexington, Drew Leenhouts tossed a four-hit shutout to lead the Blue Sox to a 4-0 win over the Reds and even their series at 1-1. Dan Graham had two RBI’s for Lexington and Jeff Vigurs added two hits. Aric Dama took the loss. Semi-final action continues on Tuesday with game three of each series scheduled. The Bulldogs and Chiefs will play at Maplewood (8:00 PM) while the Reds and Blue Sox meet in Watertown at 7:45 PM. UPDATED 11:53 AM– PLEASE NOTE THAT DESPITE A REPORTING ERROR IN TODAY’S BOSTON HERALD, TONIGHT’S GAME TWO BETWEEN THE READING BULLDOGS & ANDRE CHIEFS WILL BE PLAYED AT MORELLI FIELD IN MELROSE STARTING AT 8:00 PM. GAME TWO OF THE LEXINGTON BLUE SOX & WATERTOWN REDS WILL BE PLAYED TONIGHT AT LEXINGTON HIGH AT 8:00 PM. The Andre Chiefs and Watertown Reds both took opening game wins in their respective best of five semi-final series on Sunday night. The Chiefs got a 10 strikeout performance from Jared Freni, in his return to the rotation, to lead them to a 3-1 win over the Reading Bulldogs at Maplewood. Freni went five innings plus to get the victory and Tim Dunphy (6th inning) and Anthony Sullivan (7th inning, save), supplied the relief as Chiefs’ pitching struck out a dozen. Juan Portes, with a first inning double, and Mike Andre, who had a fourth inning single, had the RBI’s for the Chiefs. Jack Burke worked the first five innings for the Bulldogs before giving way to Colby Morris. E.J. Martinez drove in the Reading run with an RBI single in the sixth inning. In Watertown, Bill Sullivan went the distance and allowed just four hits when the Reds beat the Lexington Blue Sox at Victory Field, 4-1. Mike Samko, who had two hits in the game, drove in the game winner with a sacrifice fly in the bottom of the fourth. In an oddity, three of the five runs scored in the game did so on wild pitches. Sullivan, struck out six and didn’t issue a walk. He threw 110 pitches in his route going outing. Ryan Filipowoicz, (4.0 innings, 2 earned runs, 4 hits, 5 K’s) and Jeff Blount (2.0 innings, 2 runs, 0 earned, 3 hits, 4 K’s ) worked for the Blue Sox. Dave Ahern (double, single) had two of Lexington’s hits. ICL semi-final action continues on Monday with the second game of both series on tap. The Chiefs and Bulldogs meet at Morelli Field in Melrose and the Reds and Blue Sox tangle at Lexington High. Both games will start at 8:00 PM. The Reading Bulldogs beat the Melrose Americans 3-1 on Friday night at Morelli Field to sweep their best of three first round series and advance to the ICL’s semi-finals. The Bulldogs got a five inning, three hit, outing from Wayne Lundgren, who got the win. Johnny Hayes drove in two of Reading’s runs while Kyle Devin drove in the third. Mike Taylor had a perfect three for three night at the plate for Reading. Cody Hall went the final two innings, allowing just one hit, to get the save. Shawn Smeglin (3.0 innings) and Kevin McGlinchy (4.0 innings) worked on the mound for the Americans. The Bulldogs will now meet the Andre Chiefs in a best of five semi-final series that begins on Sunday night at Maplewood Park (Malden Catholic) at 8:00 PM. In the other semi-final series, the Lexington Blue Sox and Watertown Reds will also get underway on Sunday. Game One of that series will be played at Victory Field in Watertown starting at 7:30 PM. Julian Alavarez doubled home Thomas Russo with what proved to be the winning run when the Lexington Blue Sox beat the Somerville Royals 4-3 in Lexington on Thursday night. With the win, the #3 Blue Sox take the series 2-1. The defending champs will now move on to meet the #2 Watertown Reds in a best of five semi-final series that begins on Sunday night at Victory Field at 7:30 PM. Wagner Gomez put the Royals in front 2-0 with a two run homer in the top of the first inning. The Blue Sox tied things up in the bottom of the second when Dan Graham hit a two run homer of his own. The Blue Sox pulled in front at 3-2 on Taylor Ferguson’s sacrifice fly before Alvarez supplied the eventual game winner in the bottom of the third inning. The Royals cut the lead to 4-3 in the top of the fourth, and had the tying run thrown out at the plate, on singles from Gomez, Adam Johnson, Luke Ronchi, and Paul Pollano. Drew Brzozowski went four innings to get the win. Rob DiFranco retired eight of the nine batters he faced to get the three inning save. Steve Sinatra allowed only five hits in six innings, but took the loss.